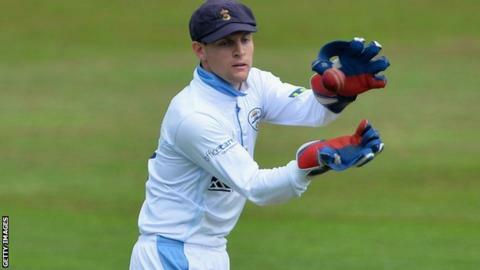 Derbyshire wicketkeeper Tom Poynton has been ruled out for the rest of the season because of leg injuries sustained in the road accident last month in which his father Keith died. A statement on the club website said the 24-year-old's injuries were "worse than originally thought". Former Lancashire keeper Gareth Cross has joined the club as cover. Meanwhile, Richard Johnson remains unavailable as he recovers from "sports performance anxiety issues". Johnson, who took the gloves for Derbyshire after Poynton was involved in the car crash, missed the club's defeat Worcestershire last week because of the illness. "The pressures faced by cricketers who are trying to be successful in a tough environment are well documented.," said Derbyshire elite performance director Graeme Welch. Cross, 29, featured in 62 first-class matches and scored 2,196 runs for Lancashire and won the Division One County Championship with the club in 2011. Since leaving the Red Rose county at the end of last season, he has played for Derbyshire's second XI on non-contract terms and has now joined the Division Two side until the end of the season. Derbyshire's opening County Championship match of the season against Leicestershire was postponed following the crash involving Poynton. Welch said he was "bitterly disappointed" that the wicketkeeper would not play any part in the campaign. "Whilst it's a setback for the lad, he's a resilient character and a strong professional. "He'll get the best possible support from our medical team during his rehab and will remain very much a part of the group," he added. Keith Poynton, 57, died when the Ferrari Spider he was driving hit a tree in Derbyshire, with his son treated in hospital for a "suspected fracture and other associated injuries".